A view from the top deck of the Brooklyn Bridge. A nice thing about this bridge is that you can drive on it, ride on it, run on it, walk on it, or plop on a park bench and sit on it. As can be seen in the photo, the bridge makes for a relaxed and pleasant environment. 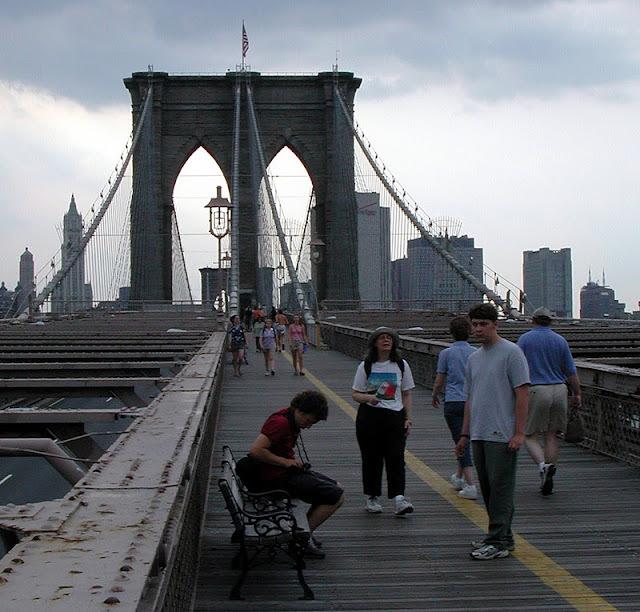 Construction of the Brooklyn Bridge was completed on May 24, 1883. It received major repairs after it's 100th anniversary, but it's currently the only New York City owned bridge to get a 'poor' rating. About half a billion dollars in repairs are scheduled over the next few years, which will hopefully bring the bridge back to a 'satisfactory' rating. However, thousands of heavy vehicles every day may be too much for this structure. A restricted load rating may do more than repairs to keep this bridge around for another 126 years. New York City's Bridges: Brooklyn Bridge (3) by Mark Yashinsky is licensed under a Creative Commons Attribution-NonCommercial-ShareAlike 3.0 United States License.